It’s always exciting heading out to The Big Apple. The buzz starts in the departure hall, and the airline staff make sure you’re psyched up throughout the flight. If you’re lucky, you can ignore the early/late take off and just sit back and drink/eat your way through the 9 and a bit hour flight. But if you’re anything like me, after a couple of hours sitting still, you begin to get a bit twitchy! So any in flight entertainment is a welcome distraction- but how many films can you actually watch without going cross eyed? 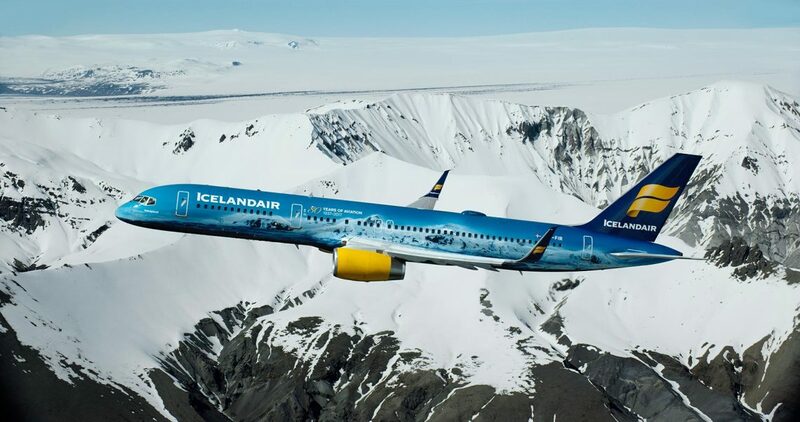 To celebrate Icelandair’s eightieth year in business, the progressive airline has chosen to a rather novel way to blow their own trumpet!! And I was on the breakthrough flight via Reykjavik to JFK, and came across some extremely memorable characters to help celebrate the historical journey en route. With a unique project to immerse selected (willing) passengers in a riveting theatrical performance at 30,000 feet, is certainly one way to keep occupied on your journey. The tell tale flower badge I was gifted in departures, was the only giveaway for the actors, in order to seduce me with their tales. So once I had agreed to partake in the experience, I had signed my life over for a completely unpredictable ride! With excitement in the air, as I really didn’t know what to expect, I was joined by likely, and unlikely characters over the duration of the flight. From a full on sing song, to champagne toasting, I became engrossed to the story of the notorious Edda, and was quite looking forward to the eightieth birthday party when we landed in KEF. Any thoughts of Iceland being a bit conservative will be knocked out of the park after this trip! If you just considered Iceland for it’s ice and scenery, consider Iceland most famous export, Bjork; This experience showed more quirk than you could shake a snow covered stick at, and even though most of the cast were made up of actors, some of the actual crew had joined a summer acting school too! The ultimate goal of the captivating theatrical spectacle was to keep passengers occupied, intrigued and educated with the story of the women who rule Icelandair and how they made history with their first all female crew. As a result, once I had got to grips with the exaggerated costumes (did we really dress like Alex the nineties raver and the pretty hippy couple??) I began to like these likeable characters. All of them had a story to tell, and didn’t mind my awkward journalistic questions! At least, they handled them well…. Especially the pink shirted, eighties briefcase toter, who was the epitome of Mr Know It All! I think the key to anything immersive is embracing it to the full, and Icelandic folklore tales, the relationships between family members, the drinkers, the storytellers and the charmers certainly helped pass the time. I would have been three films and several whisky gingers down without it! Stopping in Reykjavik for a two hour stopover was a welcome respite, and allowed for leg stretching and champagne quaffing in the lounge; A swing band and balloons adding to the party atmosphere, and certainly revived any flagging passengers for the final leg of the journey. Icelandair is actively encouraging a stopover in Reykjavik, and after visiting, I can see the temptation. Offering a completely different break to the Americas, the glaciers and geysers are one of a kind, and if you are feeling really adventurous, you must experience a dip in the Blue Lagoon. Stay for two nights, or up to seven, this refreshing experience is a perfect New York City treat. And if you book a Stopover Pass (allowing a free seven-day stopover on transatlantic flights) you are entered into a ballot to win tickets for a range of performances in Iceland; from intimate gigs to backstage passes at a music festival. I can’t promise that you will get to meet Alex the raver, but if you allow yourself a couple of extra days, pack a warm coat, your life will be enriched by the Icelandair experience. Visit Iceland via Icelandair for the experience of a lifetime! Available on outward travel only until March 2018.